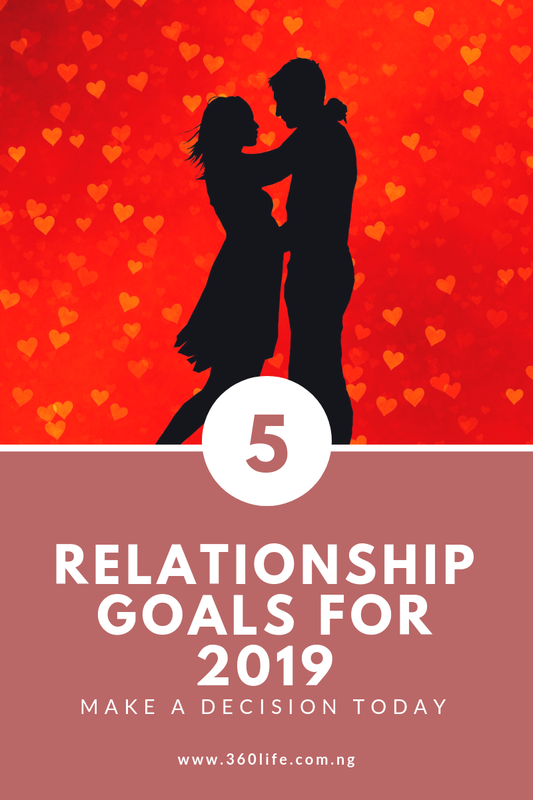 It's time to sit down and evaluate your relationship goals. Is it giving you what you want or better what you need? If not, don't you think there is something you are not doing right? 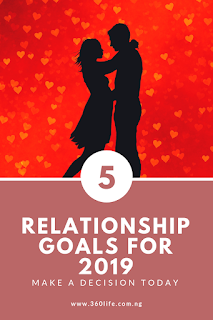 This post will show you some relationship goals that you need to apply to get answers. The goals are tested and trusted. Leave your comments and questions in the comment box. One thing I advise people is don't just get carried away by the "I like you" lingual. This is for the ladies. And for the men don't just see and pursue because of what you see - beauties. Nobody wants to marry a monkey anyways BUT... 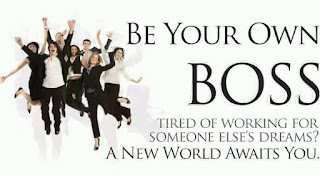 If the person you want to commit fully doesn't show interest in your basic needs, that person cannot be your helper. I didn't say you can't marry that person but a time will come when you will be needy! We are all needy people which is often very obvious in a relationship and marriage. So when this neediness comes and it can't be met consistently, it becomes a big problem. I think it is laziness on the path of a single to rush into a commitment just because you can't wait to access! Dating is for accessing if the person coming or you're chasing or you're dating can be your own helper! Are you receiving support in all ramifications in the relationship? Answer that question! You know who a helper is...someone who can "meet" your own basic needs. You know what I mean. For example.. If you dating and you have to BEG your partner for what he/she should be responsible for, maybe to be consistent in the relationship....you need to deal with that need that is not been met! This is just one of a bunch. Don't just date. 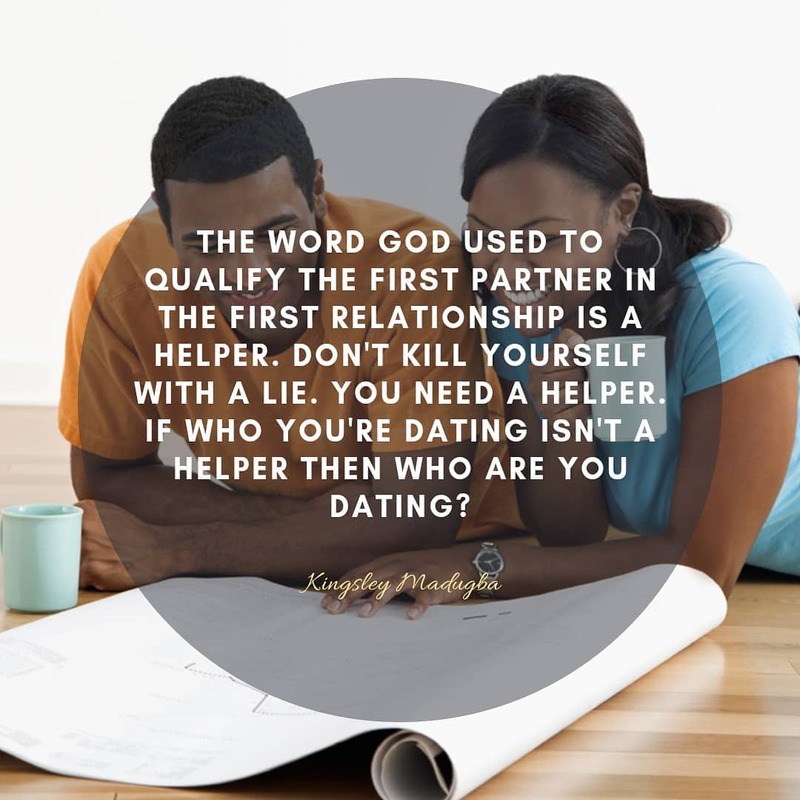 Date your own helper! Open your own eyes too. Many have often prayed for a life partner but many also have also failed to recognize the answer when he/she comes. The truth is when this person comes, singles have always desired see a FINISHED PRODUCT! That's where most have missed it. They want a finished product and when this person comes they complain. They want a perfect partner. They want a partner that has it all! God doesn't give finished product. He gives the right partner. We all have to work on our selves and be a helper to our partner. Some become impatient. They see a better package but not a better offer. They walk away only to discover that they didn't hold on a bit. This is why some have exited a breakup and wished a come back. Just because God gave you someone doesn't mean you will receive a finished product. 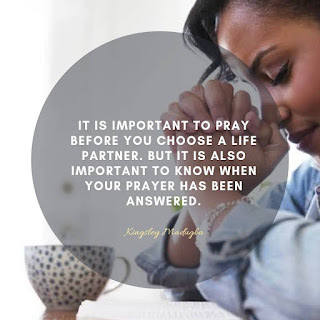 May God give you understanding to KNOW when He/she comes. Its a team job. If you keep thinking one person should bear all the responsibilities then also remember the day this person goes blue on cash you will suffer same. Are you depending on your partner for your survival? It is a different thing if you don't have and are on the lookout for something to do. But when it becomes your permanent address then know that you are building on sand. Let me advise you. If you are providing for your boyfriend all the while and he doesn't want to do anything. You are pampering his laziness. If you are providing for your girlfriend and she is relaxed and idle, you are sponsoring her idleness. It doesn't matter how small, you guys can collectively build a hoard! 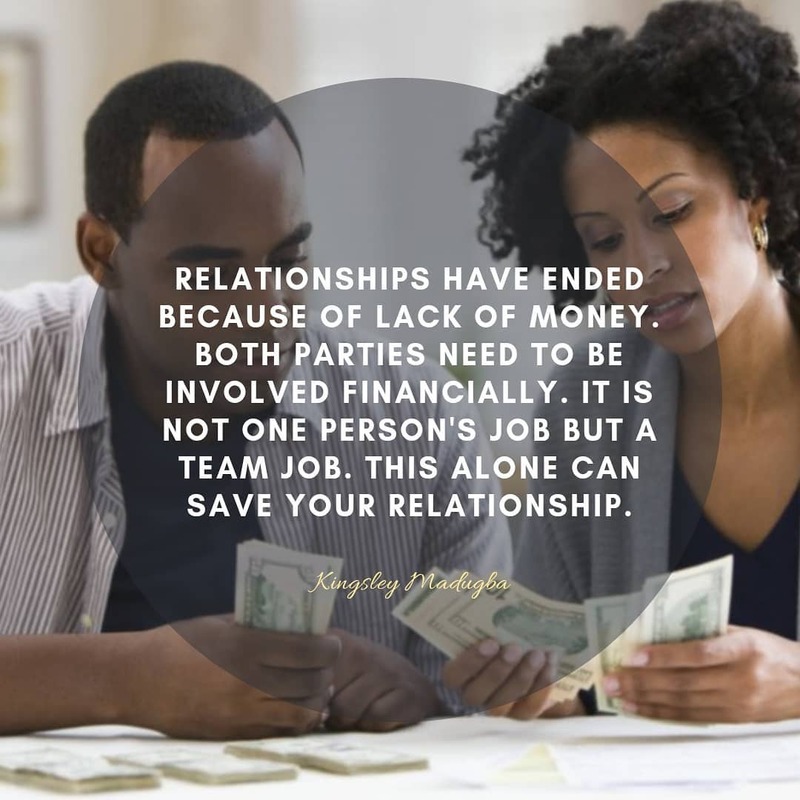 Relationships need financial planning. You will not eat I love you in the morning and night before you sleep. 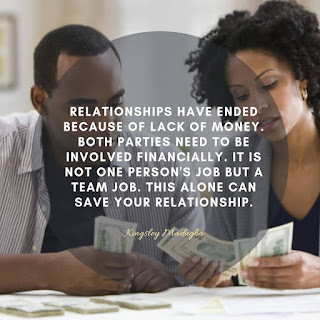 Don't enter a relationship thinking you are power mike and can carry the financial burden of the world. You will breakdown. You too need to receive. It gets interesting when you give.. And you receive too from the one you love. Dating a fine boy with no productivity or plans or goals he is working on is planning to fail. If at this time of life you're dating someone who at his best is fine, you are doing yourself. You will pay for his hair cuts to look fine and buy him data to chat with him and hear I love you, have you eaten, what did you eat last night, where are you. You remember that line don't you? Dating a fine lady with no future plans or goals is entering a ditch. You will sponsor her makeup goals and data plans. If what you access in a partner before you say yes is phones and beauties, shoes and wrist watches you are missing it. These things are ephemerals and fleeting. The don't last. LOOK FOR SUBSTANCE AND NOT APPEARANCE ONLY! Date with purpose. Be with someone who is busy and productive, someone who has goals to conquer. I love you has never paid any bill since the world began. Ask questions. As a single lady you need to know that sometimes what you see adds no value to a home. A mans cuteness without a plan will never make a home. No, being cute is not an achievement. You need a man who has where he is going to with a plan. Don't just date! Date men who have plans. As a single lady you need a blueprint and a plan. Don't say yes to a man who is just at his best cute! Men who have plans are the cutest! What do you think of this post? Comment and share. find answers to relationship questions you are looking for. 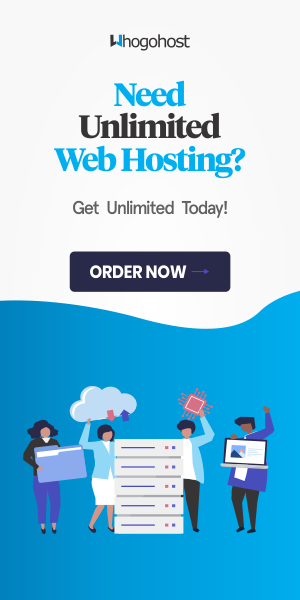 We are what you need. For other services - ghostwriting, content development, creative writing, voice over, content writing, audio transcripts, social media management "CLICK HERE"
Powerful post centering on relationship Vicky. More grace!